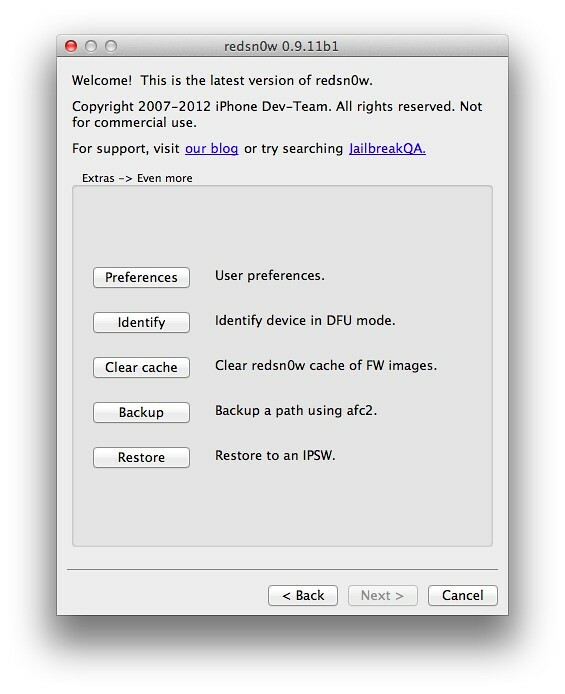 The iPhone Dev-Team has released a new version of RedSn0w that can downgrade the iPhone 4S and iPad 2/3 for those with saved SHSH blobs. ● You cannot downgrade without the personalized SHSH blobs for your device at that lower firmware. You need to have fetched those blobs while the signing window was open, using either Cydia's built-in TSS@Home feature, or with TinyUmbrella. The new Restore screen of redsn0w lets you choose either the remote blobs or local ones (for the earlier firmware). If you don't know where TinyUmbrella put your blobs, TinyUmbrella has a button that will show you (copy them out of that folder and feed them to redsn0w). ● he A5 downgrade method actually updates to the latest firmware before downgrading to the earlier one. This process updates your baseband to whatever is newest. DO NOT USE THIS METHOD IF YOU RELY ON UNOFFICIAL UNLOCKS of your iPhone4S. Those who used the temporary SAM technique to unlock their iPhones to specific SIMs shouldn't be affected by this baseband update. ● This method can be fixed by Apple with a firmware update. It's a (pleasant) mystery why they haven't fixed it yet, because reverse-engineering of the restore ramdisk indicates they do know about it. It's possibly too niche to bother to fix right now. ● The least-tested devices with this method are the iPad2,3 and iPad3,2 (because we don't have those models). If you do and you feel like experimenting, please let us know how it turns out in the comment section below! You can download the latest version of RedSn0w from here. We will be posting a tutorial on how to perform the downgrade shortly! There is a bug that makes downgrading the iPhone 4S to iOS 5.0.1 build 9A406 not work. Select SHSH blobs for 9A405 instead.